Samsung defined the term “phablet” with its Galaxy Note series, but up until last year the Korean manufacturer did not really have any worthy competitors in this niche. Nowadays the situation has changed, as multiple companies have jumped on the phablet bandwagon. Those of you up to date with the latest developments in the mobile world should be aware of the fact that the most recently announced phablet is the LG G Pro 2. How does it compare to the iconic Samsung Galaxy Note 3? There’s only one way to find out, so join us below and we’ll discuss each smartphone’s top features and hardware specifications, in detail. Today’s high-end standard in terms of screen resolution is 1080 x 1920, and while QHD screens are on their way, it will take a few more months before they go mainstream. Both the Note 3 and the G Pro 2 offer 1080p resolutions, but the screen type and diagonal differ from one device to the other. The Note 3 packs a 5.7-inch Super AMOLED screen, resulting in a pixel density of 386 pixels per inch. On the other hand, the G Pro 2 comes with an IPS Plus LCD panel, measuring 5.9 inches and offering 373 ppi. Both devices protect their displays with Corning Gorilla Glass 3. 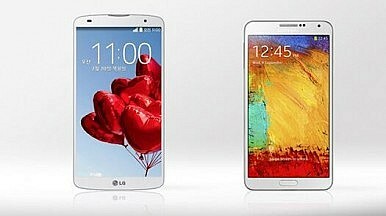 Due to the extra 0.2 inches in the screen’s diagonal, the LG G Pro 2 is a bit taller and wider than the Note 3, but not by much. It measures 157.9 x 81.9 mm, whereas the Note 3′s dimensions are 151.2 x 79.2 mm. Both smartphones come with an 8.3 mm profile, so for their heavyweight category, they’re actually quite thin. Speaking of which, the G Pro 2 tops 172 grams, making it heavier than the Note 3 by 4 grams. Design-wise, the two phablets are hardly similar. The Note 3 offers a more squarish form factor, and while it’s built out of plastic, it comes with a faux leather finish on the back panel. The Samsung-specific physical “home” button further differentiates the Note 3 from its competitor. In contrast, the G Pro 2 boasts the “LG” logo where the home button is located on the Note 3; its corners are rounder and the back panel has a plastic finish. The panel also accommodates the physical “home” and “volume” buttons underneath the main camera, in a similar fashion as the LG G2 did before it. Now that we’ve cleared the display and design out of the way, it’s time to pop the hood and see what makes these smartphones tick. When it comes to their processors, Samsung smartphones are a bit more confusing than the rest of the bunch. That’s mainly because the company usually offers its flagship phones with two different processors. In the Note 3′s case, the HSPA model comes with an Exynos 5 Octa-core processor clocked at 1.9 GHz and 1.3 GHz respectively. The LTE variant draws its power from a Snapdragon 800 quad-core processor running at a frequency of 2.3 GHz. The LG G Pro 2 shares the same processor as the Note 3 LTE – the SD 800, clocked at 2.3 GHz. There are no other variants to worry about, and the Pro 2 will pack the same CPU regardless of the region or network it’s on. Moving on, Samsung’s Note 3 has been the first smartphone to be commercialized with 3 GB of RAM. The LG G Pro 2 doesn’t let down, and matches the Note 3. However, when it comes to storage, the LG flagship is going to be retailed with 16 or 32 GB of internal memory, whereas Note 3 enthusiasts can pick up the handset with 16, 32 or 64 GB of ROM. Fortunately, both smartphones offer the possibility of expanding the storage by up to an additional 64 GB via microSD. Last but not least, both the G Pro 2 and the Note 3 draw their energy from 3,200 mAh Li-Ion batteries, but battery life will most likely differ from one device to the other. However, until the G Pro 2 will land on the market and battery experts will review the unit, it’s difficult to pick a winner in this regard. This is a very interesting comparison, and it’s a prime example of how the amount of megapixels doesn’t make a camera better by default. Both the Note 3 and the G Pro 2 come with a similar camera combo (at least in terms of megapixels), offering a 13 MP main sensor and a 2 MP front-facing unit. Actually, the G Pro 2 has a 2.1 MP secondary camera, but you probably won’t notice a big difference. More importantly however, is the fact that the G Pro 2′s camera comes with optical image stabilization and [email protected] / [email protected] / [email protected] video recording capabilities. Sadly, the Note 3 does not offer OIS, despite Samsung’s efforts to implement the technology earlier last year. It is also limited to [email protected] / [email protected] video recording. Lastly, we should also touch the topic of sound quality. Once again, it’s difficult to pick a winner given the fact that the G Pro 2 is not out yet, but the handset in question sounds promising enough to wow us with its audio capabilities. This is due to its 1-watt speaker which is said to deliver 30% more volume and clearer tones than the original G Pro. Unsurprisingly, LG will launch the G Pro 2 with Android 4.4 KitKat out of the box, whileSamsung already included KitKat on the Note 3. Nevertheless, due to the nature of these phones, you won’t really be able to gaze at all of those vanilla Android 4.4 features. Both smartphones are packed with their manufacturer’s proprietary user interfaces. The Note 3 oozes TouchWiz, while LG has developed a new UI for its G Pro 2 as well. This should probably be a nice segue into the stylus topic. After all, the Note series’ S Pen is probably one of the main reasons why the line-up has been so successful. That, combined with a wide range of productivity software features. Sadly, the G Pro 2 adopts a more conservative approach to the phablet niche, and lacks a stylus pen. Evidently, this also means that you’ll be missing out on some of the productivity software features offered by Samsung. On the other hand, LG made a few unique software implementations of its own, such as the KnockCode security option, allowing the user to easily unlock the smartphone while the device is still sleeping. All in all, both the G Pro 2 and the Note 3 are fantastic large-screen devices, but they’re also two different beasts locked in what seems to be a fairly even fight. Picking one handset over the other will most likely depend on your expectations. If you’re into the whole Wacom digitizer goodness, then the Note 3 is the only way to go. But assuming that you couldn’t care less about the presence of a stylus (or lack thereof), then the G Pro 2 might actually be a more interesting choice. As usual, it’s up to you to decide which smartphone ticks your boxes, and as always, we’d like to hear your opinion. Don’t hesitate to share your thoughts in the comment section below. Sony Xperia Z2: How Does it Stack Up Against Rival Android Flagships? Sony’s new handset, bordering on a phablet, offers numerous upgrades and a powerful camera.